Counter Strike: Global Offensive is a demanding game for any level of player. From professionals to casual gamers, leveling up can be a challenge if you’re not working with the best possible PC peripiherals. A proper gaming mouse designed for First Person Shooters can give you a surprising advantage in a competitive environment. Gaming mice designed for CS:GO and other FPS games offer greater speed, point-blank accuracy and superior response times. Combine all these advantages, and the head-shots will start rolling in. The Logitech G303 Daedalus Apex Performance Edition Gaming Mouse is a mouse that can fit the budget as well as work fantastically for any gaming enthusiast. This mouse has a lightweight design that is perfect for gamers who want speed and accuracy. It bears the PMW3366 sensor, which Logitech brags as being their most accurate optical sensor. It clocks in with a whopping 12,000 dpi, impressive for the price. With the ability to switch your DPI between five settings without leaving your game you can quickly change your mouse tuning when you need it most. And with a sleek modern-looking and simple design the mouse will look great next to any rig. Did I mention it has lighting customizability? RGB customizable lighting will never let the mouse be boring and you can change it as your taste changes or your hardware changes. Verdict: This mouse seems perfect for those who want the most bang for their buck. Logitech has done well in providing a great looking mouse and keeping the price friendly. Danish gaming peripheral manufacturer SteelSeries has several mice in their rival series, and the 300 is in the lower mid-range. With four mice bearing the Rival name, which one should you choose? While it’s a simple looking mouse, and only has 6 buttons, there is more than meets the eye. This mouse is about feel. With the rubberized grip on the sides the mouse you just feel like you have more control. Where it lacks in range of DPI options, it only clocks in at an average 6,500 DPI, it will make up for with flare. Coming in a range of custom color options, there is surely a right look that fits your style. If you’re trying to decide between the other Rival options, the 300 looks markedly better than most other models in the Rival line. And while it doesn’t come with the cool options that some of the others do (such as a changeable cable), it does still allow you to have your very own customizable 3D Printed nameplate. Verdict: The SteelSeries Rival 300 Optical Gaming Mouse is great for FPS games. It’s simple and it does the job you need it to without any distractions. Does your mouse feel a little too light? Want a more tactical and heavy feel? Then you should check out the Logitech G502 mouse. One of the main selling points of this sweet looking mouse is that you can change the weight and balance, which comes in handy when you need that extra heft in many games – especially when you need added control for sick headshots. The G502 is an optical mouse that comes with the great PMW3366 sensor that you can find in some of the other models they produce. With a DPI of up to 12000 and on-the-fly switching available, it’s perfect for the FPS enthusiast. Beyond weight and accuracy, what else are you getting in the G502? It comes with 11 programmable buttons, so you can set your macros and have some to spare. And if you don’t like the standard Logitech blue on black, the lighting is customizable up to 16.8 million colors – if you can count that high. Higher price range, but well worth it to bring your CSGO skills to the next level. Verdict: This is a wonderful mouse, thought the price point may be a bit high for budget gamers. You don’t typically know BenQ for much other than their great monitors, so to see them in the mouse business may be surprising at first. Even more surprising is the fact that BenQ’s ZOWIE EC1-A is the mouse of choice for many CSGO pros out there. We’d say it definitely has more of a presence than some of Razer’s models do, which is no small feat. On the surface, it does look a bit like a Razer DeathAdder with a BenQ logo slapped on it. Under the hood, it does clock in with a max DPI of 3,200, which might seem lower than the massive 16,000 DPI mice you’ll see on the market nowadays. That being said, don’t get sucked in by the marketing talk and buzzwords. For the vast majority of gamers out there, 3,200 max DPI is absolutely perfect for some competitive CSGO – why else would so many pros opt for this ZOWIE, running it at a nice 400 DPI setting? The fact of the matter is that this thing just works, and it works well. Don’t believe us? Give it a try yourself – you might just join the ranks of CSGO pros that have ditched Razer in favor of this nifty little BenQ. Ergonomic design fits right handers perfectly. A solid build, and simple design. No frills – may be too stripped down if you also play other game genres that benefit from additional buttons. Verdict: This is a rock solid mouse that you can rely on for headshot after headshot after headshot. 3360 optical gaming sensor with 400/800/1600/3200 DPI to ensure ultra-accurate movements and responsiveness, giving you the advantage on the battlefield. Ergonomic design with multiple shapes and sizes to maximize performance and provide a comfortable gaming experience for competitive eSports players. Consistent tactile feedback eliminating double switch presses, ensuring efficient functionality, and sleek design. The Razer Mamba Tournament Edition is the most recent Mamba Model. If you’re looking for a high performance FPS mouse that comes with some slick looking color options, this mouse fits the bill. There are two sleek strips down each of the mouse’s sides that have RGB colored lighting which offer a unique look to the mouse. These colors come in a wide variety of options – 16.8 million color options to be exact. It’s Pretty. Plenty of customizable options to keep you satisfied. Wonderful ergonomic design that fits the hand perfectly. Price point may seem steep for gamers on a budget. Verdict: Other than the standard Razer pricing, you can’t go wrong with this mouse. The best mouse for CSGO isn’t just laden with FPS features – it’s also ergonomic and designed to fit nicely in your hands. Folks with big hands will find a larger mouse comfortable and vice versa for small hands. The problem lies in finding sufficient models that are large or small since the majority of gaming mouse manufacturers target the average hand size. DPI is equally important for FPS gamers. Dots Per Inch or the mouse sensitivity determines just how quickly the cursor moves on screen for every minute twitch of the mouse. Lower DPI translates to less movement than higher DPI. Accuracy, however, has nothing to do with DPI as at times lower DPI is more accurate than higher DPI, depending on the gun you use. If you thought that buttons, response times, ergonomics and DPI are the only factors influencing your CS GO experience then think again. There are a lot more factors at play here. Size, Polling rate, feedback, optical sensor and button type are just as important. We have done all the research for you and compiled a list of FPS mouse that will give you the best results in Counter Strike: Global Offensive. But, before we get to the list, let’s first investigate each factor a little further and see how they affect your overall CS GO experience. How do you grip the mouse? Do you prefer a firm palm grip or a lighter claw grip? In tight situations, some people gravitate towards a claw grip with the fingers curled in while others prefer clutching at the mouse tight with their palms. Likewise, when you are dominating your opponent, you may relax and switch for a fingertip grip. Everyone has a default grip style, but in different situations, your grip changes. To be a successful CS GO gamer, you have to feel comfortable with your mouse in all kinds of grips. Obviously, better the fit, more accurate and faster you will be. We are seldom aware when we suddenly change grips in the middle of the game. It is human nature to react to changing situations, and a change in grip is just that. If your mouse is too short, you experience a drop in accuracy switching to a palm grip. Hence, your objective as a CS GO gamer is to find a mouse that is comfortable and responsive no matter how you grip it. The next segment will address the size concerns keeping in mind various grip types. What size hands do you have? Are your hands big or are they small? Get a measuring tape right now and measure your playing hand starting from the wrist all the way up to the tip of your fingers. If you fall anywhere above 7.5 inches, you have large hands. But, if you fall under 6.5 inches then you have small hands and need a compact gaming mouse. Figuring out the correct size is a fundamental component in finding the perfect fit. Ideally, you want the mouse to sit comfortably within your palms without any wiggle room. Additionally, your fingers should stretch over the buttons to the edge without tipping over. A mouse sized for your hands will always feel comfortable and accurate. After all, in stressful situations, you might go palm intense and grip the mouse tight. You could also switch to a claw grip and need your fingers to hit those buttons quick. The speed at which your mouse communicates with the computer is known as polling rate. It is measured in Hertz or Hz, and for a gaming mouse to function smoothly in CS GO, 500Hz is the least you need. When we say 500Hz, it translates to 2ms for information to flow between the mouse and your computer. Similarly, a 1000Hz polling rate signifies 1ms. Naturally, higher the polling rate, better the accuracy in CS GO. As your computer receives information from the mouse, it assimilates the data into meaningful crosshair movement and commands onscreen. The downside however to higher polling rate is that it requires greater computer power. Thankfully, CPUs today are quite capable of managing high polling rates. As a gamer, high polling rate helps you reduce reaction times and improve your aim. Though polling rate isn’t the only criteria determining aim; it plays a vital role in improving upon your natural aiming abilities. It is the first time we introduce a comparison between Laser and Optical mice. In all our other mouse guides, we chose to skip this segment because both perform at par in almost all situations barring one – First Person Shooter games. Yes, there is a huge difference between the two commonly used sensors in a gaming mouse. In technical terms, lasers are highly concentrated beams that reflect off every single bump or unevenness on the surface you use it on. Whereas, an optical mouse uses optical sensors that emit light rays, which bounce off the top of any given surface. Naturally, laser mouse has higher DPI ranges with a sensor that can catch a lot more information. The tracking is also more accurate, but it is due to this high degree of precision that it can cause jitters. As a gamer, this translates to sudden movements on the screen that you never intended to do. Unfortunately, jitters are a limitation of Laser technology, and it has everything to do with the surface on which you use your mouse. No surface can ever truly be flat. Since a laser mouse is so accurate, it naturally picks up on any tiny crevice, peak or ridge on the mouse pad, unlike an optical mouse. Games like CS GO benefit from high DPI settings but more so from stability and efficiency. Optical sensors are efficient because they work on any surface and do not suffer from crosshair jitters. CS GO demands a low lift off distance. It is the distance your mouse has to rise before it loses tracking mid-air. Why is this necessary? Imagine a tense situation where the enemy blindsides you. You have to react quickly or risk a headshot. By lifting up your mouse and reorienting your aim, you save valuable time without impacting accuracy by much. As a rule, for any competitive FPS game, you should seek to get a mouse with less than 2mm of life off distance. If you cannot afford a low lift-off, settle for anything below 2.5mm. Sensitivity is the software side whereas DPI is the hardware side of a mouse’s sensitivity index. It is always recommended to keep one of the two settings turned off or constant and change the other according to the fixed value of the former. Usually, in games like CS GO, you keep the sensitivity set and change the DPI. Dots Per Inch is the speed with which the physical mouse movement will translate into action on the screen. Naturally, higher resolution screens will register a lower change as opposed lower resolution screens. Take a 550dpi mouse (a typical custom setting among many professional CS GO gamers). If your screen resolution is at 1080p, you cover 550 dots per inch, but if you suddenly change the resolution to 1440p, you will cover a lot less distance though technically you still hit 550dpi. That is because DPI is only translating your mouse movement onto the screen depending on the display resolution. Hence, if you game at 2K or even 4K, consider getting a top-of-the-line high DPI custom profile mouse. For most CS GO gamers though having three DPI settings is sufficient so long as the highest is at around 1000dpi. With a new mouse, the DPI settings can feel a bit different as you get used to its feel. Practice with a new mouse for at least a few hours before entering competitive gaming as you may find the new design, weight and other factors slightly foreign. CS GO is a First Person Shooter, and the sole objective of a first person shooter is to shoot your opponents dead. The game involves two main activities – shoot and reload. Your mouse is more than sufficient to handle an FPS game if it has at least two buttons and a scroll wheel. Hence, custom profiles and macros have no place in an FPS game such as CS GO. At best, you can configure a couple of extra mouse buttons to throw grenades or duck but nothing more. The money you spend on a gaming mouse with high-level button customization can go into a better keyboard with anti-ghosting or a noise cancellation virtualized headset. 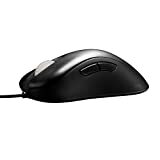 However, if you play more than just CS GO, such as WOW or other competitive MMO games, then you should spend the extra cash on an optical gaming mouse with high polling rates and plenty of custom profile/macros. Any gaming mouse must always track your movements with precision. However, some devices come with acceleration support. If you find your manufacturer includes acceleration in its mouse software, disable it immediately. This feature in some gaming mouse is handy in paning across huge maps but does not help in FPS gaming. It increases the speed of cursor movement the more you move your mouse instead of using fixed speeds relative to your hand movements. You may have heard of mechanical keys but did you know that gaming mouse devices use a similar feature too? Several manufacturers make these mechanical switches, but the most popular are Cherry switches and Omron switches. Both of these are similar in their behaviour to mechanical keys in that they register a click after receiving sufficient amount of weight or force. Naturally, with a fixed force required to depress such a switch, you cannot have accidents, and neither do you make accidental second clicks. Yes, mechanical switches increase the price of a gaming mouse, but it is worth investing in such a device if you can. Having complete control over when you want to fire, reload and other activities in CS GO, gives you that edge when you are in an intense battle for survival against a horde of enemies. Gaming mouse designed for FPS games such as CS GO can cost upwards of $100. If you can afford well-known brands with established models, then do not bother reading this section. However, if you want an affordable solution with just the minimum features necessary for CS GO gaming, you can look at Chinese companies. There are several new entrants with models offering multiple DPI settings, high polling rates, Omron like switches (not the same as Omron switches but cheaper knockoffs) and an ergonomic design. They tend to draw inspiration from more successful brands and models though costing much less. CSGO is a highly competitive game demanding hours of practice along with the best PC peripherals. While a top notch gaming mouse exclusively designed for FPS will go a long way in giving you the winning edge, it is not enough. Invest in a good mechanical anti-ghosting keyboard, a good headset with zero crosstalk and spend hours owning each of your peripherals until they are second nature to you. Only through practice and time can you get batter at CSGO. A good gaming mouse only helps you get there faster by limiting negative external factors. Remember, the hard work is all on you!